There are many iconic articles of clothing in a man’s wardrobe — everything from a pair of 501 Levis jeans to your Chuck Taylor converse shoes. But no wardrobe is complete without a few classic flannel shirts. Sure, flannel shirts may be seasonal — but when the season arrives, there’s no shirt that is more comfortable than a well-worn cotton flannel shirt over a pancake breakfast and cup of coffee! One of the best qualities of the flannel shirt is the brushed finish of the cotton — which means the shirt has a soft, already broken in feel. 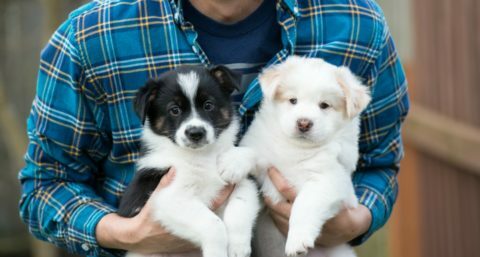 Flannel shirts can be found with button down collars, as well as standard collars. The pocket styles on mens flannel shirts range from single chest pockets to double flap utility pockets. The flannel shirt can be worn tucked or untucked with your favorite pair of jeans or chinos. While you can wear a t-shirt or Henley underneath, the soft brushed finish of the cotton certainly allows you to wear a flannel shirt without anything underneath as well. It’s a great shirt to layer under a denim jacket, crew neck, v-neck, or cardigan sweater. 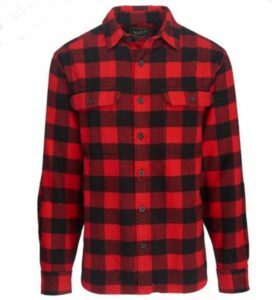 Mens flannel shirts can certainly be worn at the office (especially lightweight 4 ounce flannel), casual dinner with friends, Friday night football games, or hanging out in the great outdoors by a campfire. The greatest thing about mens flannel shirts is that they don’t require dry cleaning. 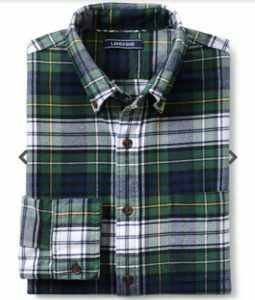 If you just lightly press a flannel shirt with an iron (without starch), the comfort it brings will exceed any other shirt in your wardrobe! The oxbow bend plaid flannel shirt from Wollrich is my personal favorite. The weight of the shirt is perfect, and I really like the durability of the double-layered forearm, back yoke, and front placket. This 100% cotton flannel shirt is my go-to for outdoor adventures and weekend chores. 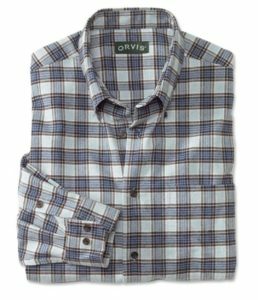 The 100% cotton luxury flannel shirt from Orvis is truly luxury! This classically styled flannel is what I wear for my business casual Fridays layered under a nice cardigan and a pair of flannel-lined cotton chino pants. This is the flagship flannel shirt that I like as my everyday flannel with my favorite jeans. I also like the fact that they have several fit options as well as a “tall” option which gives you a little extra in sleeve length.